Home Misc. Corvette News Scoop! Mid-Engine Chevrolet Corvette is a Go! Scoop! Mid-Engine Chevrolet Corvette is a Go! You like rumors? Hot, hard-to-resist rumors? Here’s one to jack your blood pressure through the roof! The next Chevrolet Corvette ZR1 will be mid-engined. That’s right, kids! Multiple sources have told us that the next version of the Corvette ZR1 will be mid-engined. One of these sources even stated that the next-generation Corvette — the C8 — will ship with its engine mounted in the middle. 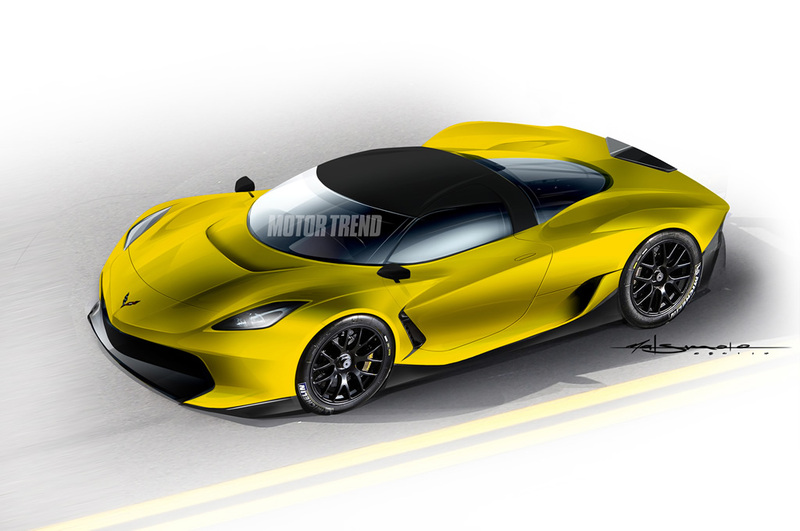 The rendering above, by Tom Matsumoto, shows what the mid-engined Corvette could look like. The C8 platform will be able to accommodate a mid-engine design and an ultra high-performance, mid-engined Corvette called the “Zora” will be offered. This mid-engined Corvette could be powered in a similar fashion to Porsche’s 918 Spyder supercar, or the new hyper exotic Ferrari LaFerrari ; both of which use a hybrid-based powertrain. If there’s any validity to Motor Trend’s “scoop”, our prediction might not be too far off base! !